Well designed French trade knife with nice sweeping lines. Large knife used well-used for all purposes at the frontier. 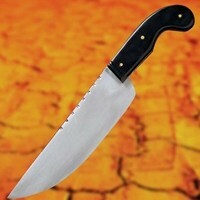 Long, wide blade 21cm x 5.5cm with heavy back cleaver for all sorts of cutting chores. Simple jimping on the spine. Curvature of the polished buffalo horn scales over a full tang adds more control on the cut. 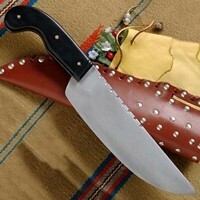 Comes with a heavy leather sheath with decorative metal studs and belt slot for correct period wear and looks.